So I just realized that my last post for Book Beginnings (hosted over at Rose City Reader) and Friday 56 (hosted at Freda’s Voice) was also a C.S. Lewis book. What a lovely coincidence! 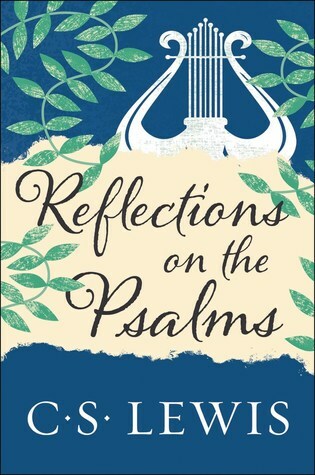 If you’ve been reading this blog for a while, you might remember that my daughter gave me Reflections on the Psalms as a birthday present last year — an incredibly thoughtful birthday present at that! I love C.S. Lewis, but I’ve found this one a little hard to get through, unfortunately. It’s full of genius, as are all of his books that I’ve read, but this one puts me to sleep a bit. That said, I’m highlighting it this week because 1) I’m almost done! (half a chapter left), and 2) Despite it’s slowness, I have learned a lot from it and I’m still glad I’ve read it; you might find it worth your time as well! This is not a work of scholarship. I am no Hebraist, no higher critic, no ancient historian, no archaeologist. I write for the unlearned about things in which I am unlearned myself. There is a stage in a child’s life at which it cannot separate the religious from the merely festal character of Christmas or Easter…But of course the time will soon come when such a child can no longer effortlessly and spontaneously enjoy that unity. He will become able to distinguish the spiritual and festal aspect of Easter…And once he has distinguished he must put one or the other first. The opening lines are a little off-putting if you don’t recognize Lewis’s genius; it is precisely this “unlearned-ness” that makes his writing approachable and understandable to so many. My excerpt above from page 56 is just one example of his ability to speak spiritual truths in a straightforward manner. This one happens to be timely, too, given that Christmas just recently passed!